The Battle for Zendikar set contains 274 cards (101 common, 80 uncommon, 53 rare, 15 mythic rare, and 25 basic land). Some Battle for Zendikar booster packs also contain Zendikar Expeditions cards (see below). The Battle for Zendikar set becomes legal for sanctioned Constructed play on its official release date: Friday, October 2, 2015. At that time, the following card sets will be permitted in the Standard format: Khans of Tarkir, Fate Reforged, Dragons of Tarkir, Magic Origins, and Battle for Zendikar. Enlist the land itself in the battle against the Eldrazi with Zendikar Expeditions. This special set includes Zendikari versions of exciting lands from throughout Magic's history. There are 25 Zendikar Expeditions cards that appear in Battle for Zendikar booster packs. The remaining 20 cards will appear in Oath of the Gatewatch booster packs. Zendikar Expeditions cards have their own expansion symbol. Zendikar Expeditions cards are very rare. You can expect to open one only a little more frequently than a premium foil Battle for Zendikar mythic rare. Zendikar Expeditions cards appearing in Battle for Zendikar booster packs are playable in any Limited event using those booster packs. In a Sealed Deck tournament, those cards are part of your card pool. In a Booster Draft tournament, you must draft those cards for them to be included in your card pool. However, Zendikar Expeditions cards are not legal in any Constructed format the cards weren't legal in before. Appearing in Battle for Zendikar booster packs does not make them legal in Standard. Premium foil English Zendikar Expeditions cards appear in booster packs of all languages. At the beginning of the game, each player draws cards equal to that player's starting hand size (usually seven). In turn order, each player chooses to either keep those cards as an opening hand or mulligan by shuffling those cards back into the library and drawing a new hand with one less card. Each hand drawn this way may also be kept or mulliganed, with additional mulligans drawing one less card each time until each player has kept an opening hand. After players have kept their opening hands, each player who kept fewer cards than his or her starting hand size looks at the top card of his or her library. That player may then put that card on the bottom of his or her library. (This is essentially the "scry 1" keyword action). If multiple players mulligan, the starting player is the first one to look at the top card of his or her library and decide whether to move it to the bottom. Then, in turn order, each other player who mulliganed does the same. No matter how many mulligans you take, you only look at the top card of your library once, after you've decided to keep your hand. You can't look at multiple cards or move multiple cards to the bottom of your library this way. In some multiplayer formats, you don't lose a card from your opening hand after your first mulligan. You would need to take a second mulligan before being allowed to look at the top card of your library or move it to the bottom. Each player who mulliganed decides whether or not to move the top card of his or her library to the bottom before any player uses the "opening hand" abilities of cards such as Leylines. The Eldrazi transcend the colors of mana as we know them. 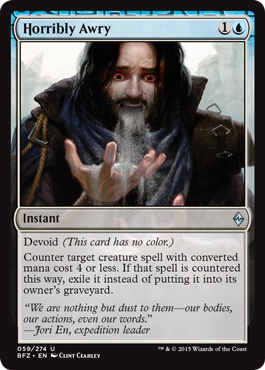 Devoid is a new keyword ability that makes a card with the ability colorless, regardless of that spell's mana cost. Cards with devoid use frames that are variations of the transparent frame traditionally used for Eldrazi. 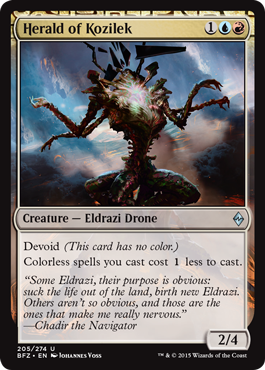 The top part of the card features some color over a background based on the texture of the hedrons that once imprisoned the Eldrazi. This coloration is intended to aid deck building and gameplay. 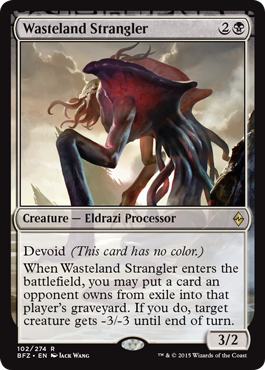 The Eldrazi ravage anything in their path, including the composite matter of those who oppose them. Ingest is a new keyword ability found on creatures that exile cards from an opponent's library by dealing combat damage to that player. Several cards in this set, most with the new creature type Processor, can use cards in exile owned by an opponent as "fuel" for various effects. If a spell or ability requires that you put more than one exiled card into the graveyard, you may choose cards owned by different opponents. Each card chosen will be put into its owner's graveyard. If a replacement effect will cause cards that would be put into a graveyard from anywhere to be exiled instead (such as the one created by Anafenza, the Foremost), you can still put an exiled card into its opponent's graveyard. The card becomes a new object and remains in exile. In this situation, you can't use a single exiled card if required to put more than one exiled card into the graveyard. Conversely, you could use the same card in this situation if two separate spells or abilities each required you to put a single exiled card into its owner's graveyard. You can't look at face-down cards in exile unless an effect allows you to. Face-down cards in exile are grouped using two criteria: what caused them to be exiled face down and when they were exiled face down. If you want to put a face-down card in exile into its owner's graveyard, you must first choose one of these groups and then choose a card from within that group at random. For example, say an artifact causes your opponent to exile three cards from his or her hand face down. Then on a later turn, that artifact causes your opponent to exile another two cards face down. If you use Wasteland Strangler to put one of those cards into his or her graveyard, you would pick the first or second pile and put a card chosen at random from that pile into the graveyard. The lower ranks of the Eldrazi forces have evolved since we last saw them. Several cards in this set cause you to put Eldrazi Scion creature tokens onto the battlefield. These tokens all have the same characteristics. 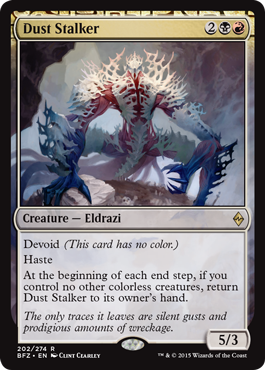 Eldrazi Scions are similar to Eldrazi Spawn, seen in the Zendikar block. Note that Eldrazi Scions are 1/1, not 0/1. Eldrazi and Scion are each separate creature types. Anything that affects Eldrazi will affect these tokens, for example. 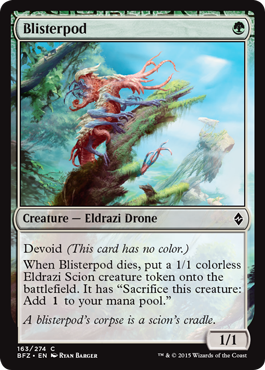 Sacrificing an Eldrazi Scion creature token to add 1 to your mana pool is a mana ability. It doesn't use the stack and can't be responded to. 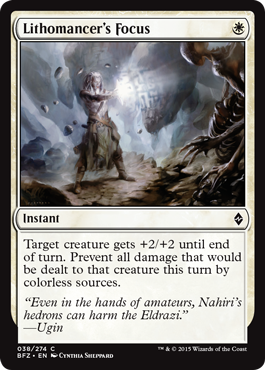 Some instants and sorceries that create Eldrazi Scions require targets. If all targets for such a spell have become illegal by the time that spell tries to resolve, the spell will be countered and none of its effects will happen. You won't get any Eldrazi Scions. Several cards in this set have a triggered ability that triggers when you cast that spell. Others have an ability that triggers when you cast other spells. 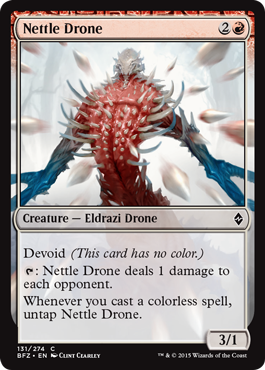 T: Nettle Drone deals 1 damage to each opponent. These abilities will resolve before the spell that caused them to trigger. Once one of those abilities triggers, it doesn't matter what happens to the spell. The ability will remain on the stack even if the spell is countered before the ability resolves. 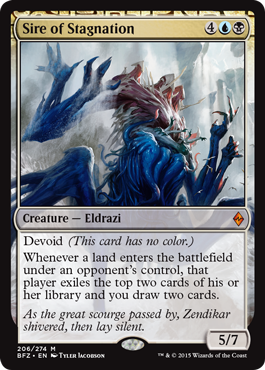 Besieged by the Eldrazi, the land of Zendikar rises up to defend itself. 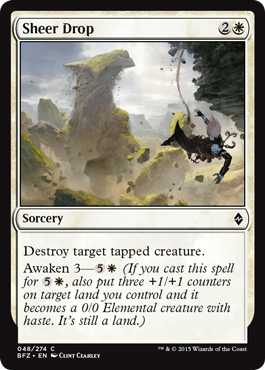 Awaken is a new keyword found on instants and sorceries that has the potential to turn lands you control into Elemental creatures. You can cast a spell with awaken for its mana cost and get only its first effect. If you cast a spell for its awaken cost, you'll get both effects. If the non-awaken part of the spell requires a target, you must choose a legal target. You can't cast the spell if you can't choose a legal target for each instance of the word "target" (though you only need a legal target for the awaken ability if you're casting the spell for its awaken cost). If a spell with awaken has multiple targets (including the land you control), and some but not all of those targets become illegal by the time the spell tries to resolve, the spell won't affect the illegal targets in any way. If the non-awaken part of the spell doesn't require a target and you cast the spell for its awaken cost, then the spell will be countered if the target land you control becomes illegal before the spell resolves (such as due to being destroyed in response to the spell being cast). The land will retain any other types, subtypes, or supertypes it previously had. It will also retain any mana abilities it had as a result of those subtypes. 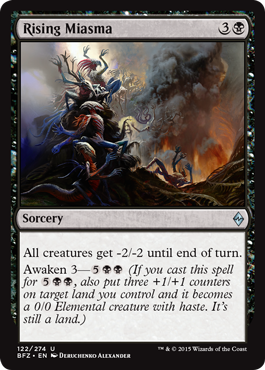 For example, a Forest that's turned into a creature this way can still be tapped for G.
Awaken doesn't give the land you control a color. As most lands are colorless, in most cases the resulting land creature will also be colorless. 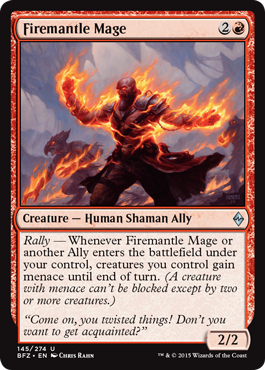 Rally is a new ability word associated with the returning creature type Ally. 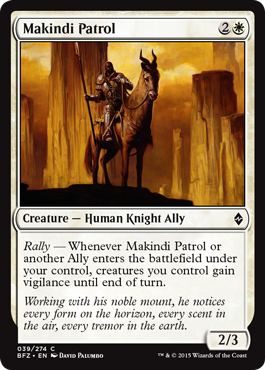 Rally is used to highlight abilities that trigger whenever the creature with the ability or another Ally enters the battlefield under your control. An ability word appears in italics and has no rules meaning. 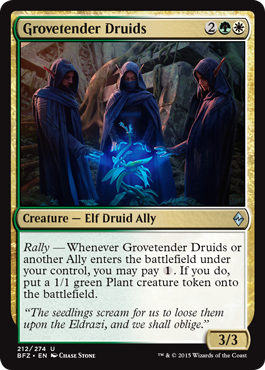 Rally — Whenever Grovetender Druids or another Ally enters the battlefield under your control, you may pay 1. If you do, put a 1/1 green Plant creature token onto the battlefield. When an Ally enters the battlefield under your control, each rally ability of the permanents you control will trigger. You can put them on the stack in any order. The last ability you put on the stack will be the first one to resolve. If a creature with a rally ability enters the battlefield under your control at the same time as other Allies, that ability will trigger once for each of those creatures and once for the creature with the ability itself. 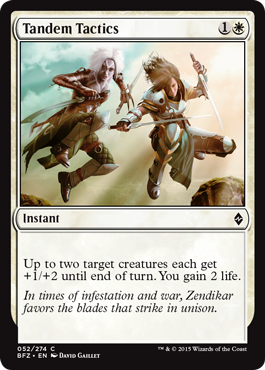 All Zendikari must join together to fight off the Eldrazi threat. 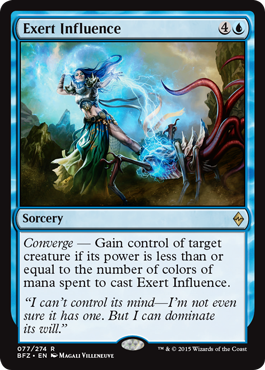 Converge is a new ability word that highlights the effects of cards that somehow depend on how many colors of mana you spend to cast them. An ability word appears in italics and has no rules meaning. The maximum number of colors of mana you can spend to cast a spell is five. Colorless is not a color. Note that the cost of a spell with converge may limit how many colors of mana you can spend. Unless a spell or ability allows you to, you can't choose to pay more mana for a spell with a converge ability just to spend more colors of mana. Likewise, if a spell or ability reduces the amount of mana it costs you to cast a spell with converge, you can't ignore that cost reduction in order to spend more colors of mana. 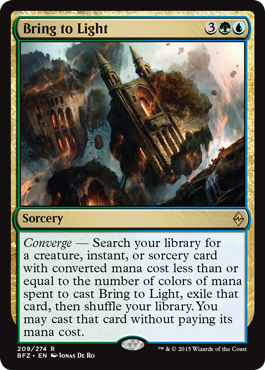 If there are any alternative or additional costs to cast a spell with a converge ability, the mana spent to pay those costs will count. For example, if an effect makes sorcery spells cost 1 more to cast, you could pay WUBR to cast Radiant Flames and deal 4 damage to each creature. If you cast a spell with converge without spending any mana to cast it (perhaps because an effect allowed you to cast it without paying its mana cost), then the number of colors spent to cast it will be zero. If a spell with a converge ability is copied, no mana was spent to cast the copy, so the number of colors of mana spent to cast the spell will be zero. The number of colors spent to cast the original spell is not copied. 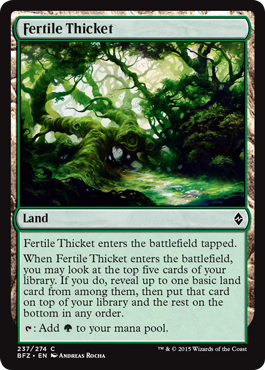 The land continues to play an important role in Zendikar's struggle against the Eldrazi. 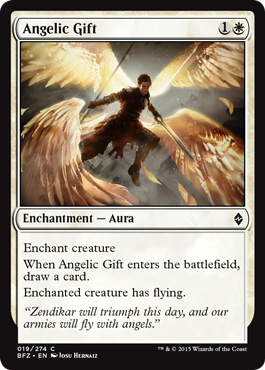 Landfall is an ability word that first appeared in the Zendikar set. It highlights abilities that trigger whenever a land enters the battlefield under your control. An ability word appears in italics and has no rules meaning. 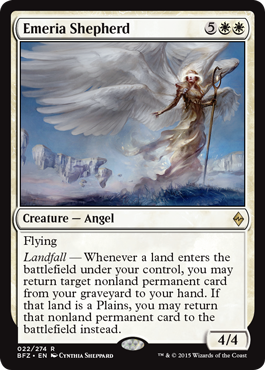 A landfall ability triggers whenever a land enters the battlefield under your control for any reason. It triggers whenever you play a land, as well as whenever a spell or ability puts a land onto the battlefield under your control. When a land enters the battlefield under your control, each landfall ability of the permanents you control will trigger. You can put them on the stack in any order. The last ability you put on the stack will be the first one to resolve. If the ability has an additional or replacement effect that depends on the land having a certain basic land type, the ability will check that land's type as the ability resolves. If, at that time, the land that entered the battlefield is no longer on the battlefield, use its types when it left the battlefield to determine what happens. Several cards in this set have an ability that triggers whenever you gain life. 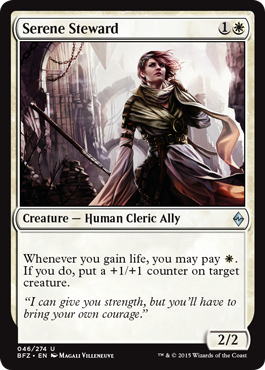 Whenever you gain life, you may pay W. If you do, put a +1/+1 counter on target creature. 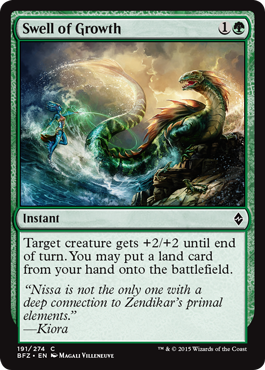 The ability triggers just once for each life-gaining event, whether it's 1 life from Drana's Emissary or 7 life from Nissa's Renewal. A creature with lifelink dealing combat damage is a single life-gaining event. For example, if two creatures you control with lifelink deal combat damage at the same time, the ability will trigger twice. 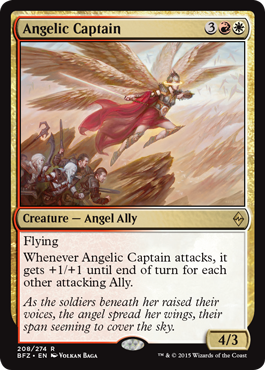 However, if a single creature with lifelink deals combat damage to multiple creatures, players, and/or planeswalkers at the same time (perhaps because it has trample or was blocked by more than one creature), the ability will trigger only once. In a Two-Headed Giant game, life gained by your teammate won't cause the ability to trigger, even though it causes your team's life total to increase. 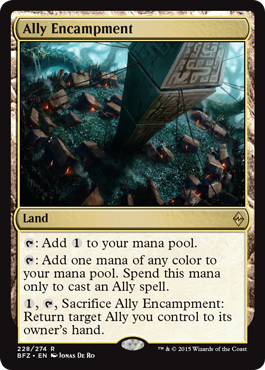 This set includes a cycle of nonbasic lands with basic land types. Each one produces one of two colors of mana. These lands enter the battlefield tapped unless you control two or more basic lands. 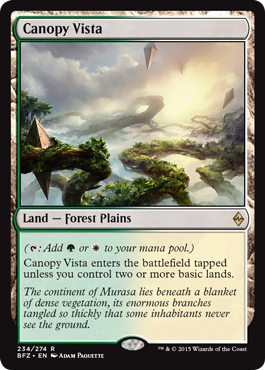 Even though these lands have basic land types, they are not basic lands because "basic" doesn't appear on their type line. Notably, controlling two or more of them won't allow others to enter the battlefield untapped. However, because these cards have basic land types, effects that specify a basic land type without also specifying that the land be basic can affect them. For example, a spell or ability that reads "Destroy target Forest" can target Canopy Vista, while one that reads "Destroy target basic Forest" cannot. If one of these lands enters the battlefield at the same time as any number of basic lands, those other lands are not counted when determining if this land enters the battlefield tapped or untapped. Tap up to two target creatures. Those creatures don't untap during their controller's next untap step. Put a 1/1 colorless Eldrazi Scion creature token onto the battlefield. It has "Sacrifice this creature: Add 1 to your mana pool." You can cast Adverse Conditions with no targets. When it resolves, you'll get an Eldrazi Scion. However, if you cast Adverse Conditions with any targets and all of those targets are illegal as it tries to resolve, it will be countered and none of its effects will happen. You won't get the Eldrazi Scion in that case. Adverse Conditions tracks the creatures, but not their controller. If either of the creatures changes controllers before its first controller's next untap step has come around, then it won't untap during its new controller's next untap step. If, during its controller's declare attackers step, Akoum Firebird is tapped or is affected by a spell or ability that says it can't attack, then it doesn't attack. If there's a cost associated with having it attack, its controller isn't forced to pay that cost. If he or she doesn't, Akoum Firebird doesn't have to attack. 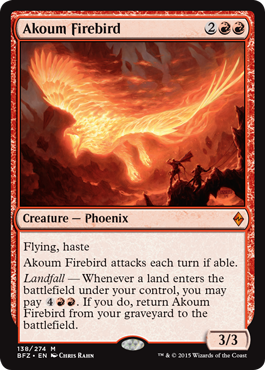 The landfall ability triggers only if Akoum Firebird is in your graveyard at the moment the land enters the battlefield. Players can respond to the triggered ability, but once it starts resolving and you decide whether to pay 4RR, it's too late for anyone to respond. Check the power of each creature as Aligned Hedron Network's ability resolves to determine if it's exiled. It doesn't matter who controls the creature. If Aligned Hedron Network exiles multiple creatures, those cards all return to the battlefield at the same time. 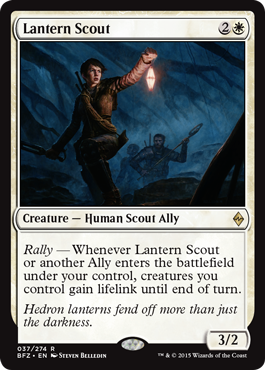 If Aligned Hedron Network leaves the battlefield before its triggered ability resolves, no creatures will be exiled. Auras attached to the exiled creatures will be put into their owners' graveyards. Equipment attached to the exiled creatures will become unattached and remain on the battlefield. Any counters on the exiled creatures will cease to exist. If a creature token is exiled, it ceases to exist. It won't be returned to the battlefield. The exiled cards return to the battlefield immediately after Aligned Hedron Network leaves the battlefield. Nothing happens between the two events, including state-based actions. In a multiplayer game, if Aligned Hedron Network's owner leaves the game, the exiled cards will return to the battlefield. Because the one-shot effect that returns the cards isn't an ability that goes on the stack, it won't cease to exist along with the leaving player's spells and abilities on the stack. In some very rare situations, Aligned Hedron Network may enter the battlefield as a creature with power 5 or greater. If this happens, Aligned Hedron Network will exile itself along with other creatures with power 5 or greater. Those cards will immediately return to the battlefield. If this causes a loop with Aligned Hedron Network continually exiling and returning itself, the game will be a draw unless a player breaks the loop somehow. An "Ally spell" is any spell with the subtype Ally. Mana produced by the second ability can't be spent to pay the costs of abilities of Allies you control. The last ability can only target an Ally on the battlefield. You must sacrifice exactly one creature to cast Altar's Reap. You can't cast it without sacrificing a creature, and you can't sacrifice additional creatures to draw more cards. Players can respond to Altar's Reap only after it's been cast and all its costs have been paid. No one can try to remove the creature you sacrificed to stop you from casting the spell. Count the number of creatures you control as the ability resolves to determine how much life you gain. Angel of Renewal will count toward this number if it's still on the battlefield. Count the number of other attacking Allies as the ability resolves to determine the size of the bonus. Attacking Allies controlled by a teammate will count toward this total. Once the ability resolves, the bonus won't change later in the turn, even if the number of other attacking Allies does. If the target of an Aura becomes illegal before the spell resolves, the Aura will be countered and put into its owner's graveyard. It won't enter the battlefield and you won't draw a card. 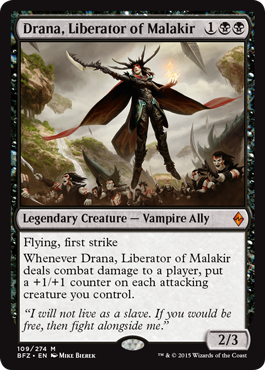 If Bane of Bala Ged attacks a planeswalker, the defending player may exile that planeswalker. Bane of Bala Ged will still be attacking and may be blocked as normal. If it's not blocked, it won't deal combat damage. In a Two-Headed Giant game, you choose which of your opponents will exile permanents. You can't have each of them exile one permanent. The permanents are exiled before blockers are chosen. If the defending player controls only one permanent, that permanent will be exiled. 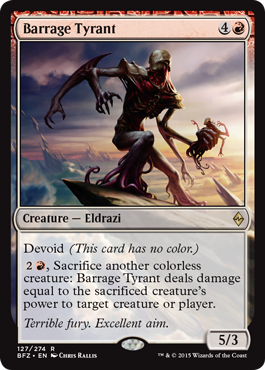 2R, Sacrifice another colorless creature: Barrage Tyrant deals damage equal to the sacrificed creature's power to target creature or player. Barrage Tyrant deals the damage, not the sacrificed creature. For example, if the sacrificed creature had lifelink, you won't gain life. 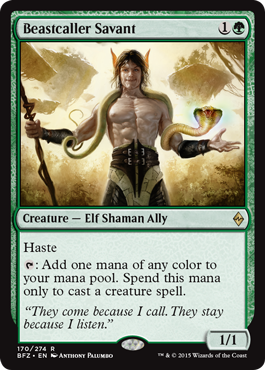 Mana produced by Beastcaller Savant can be spent on any part of a creature spell's total cost, including additional costs (such as kicker costs) and alternative costs (such as dash costs). It can't be spent to pay the costs of abilities of creatures you control. Mana produced by Beastcaller Savant can't be used to activate an ability or cast an instant or sorcery spell that creates creature tokens. 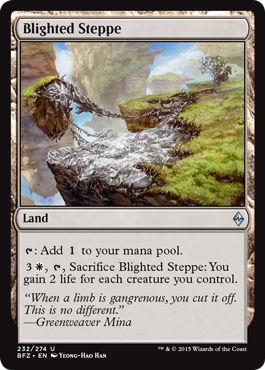 3W, T, Sacrifice Blighted Steppe: You gain 2 life for each creature you control. Count the number of creatures you control as the last ability resolves to determine how much life to gain. 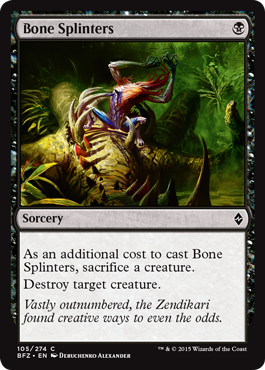 As an additional cost to cast Bone Splinters, sacrifice a creature. You must sacrifice exactly one creature to cast Bone Splinters. You can't cast it without sacrificing a creature, and you can't sacrifice additional creatures to destroy additional creatures. Players can respond to Bone Splinters only after it's been cast and all its costs have been paid. No one can try to remove the creature you sacrificed to stop you from casting the spell. If, during its controller's declare blockers step, a creature the defending player controls is tapped or is affected by a spell or ability that says it can't block, then it doesn't block. If there's a cost associated with having it block, its controller isn't forced to pay that cost. If he or she doesn't, the creature doesn't have to block. If a creature can't legally block Breaker of Armies but could block another attacking creature, it may do so. 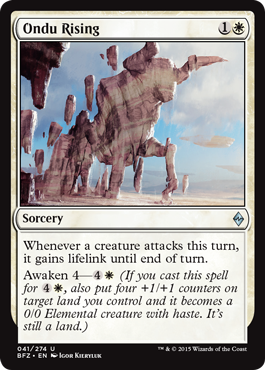 Likewise, if a creature the defending player controls can't block Breaker of Armies unless its controller pays a cost, its controller may decline to pay that cost and block a different attacking creature. If more than one Breaker of Armies is attacking, the controller of each creature that could block them chooses which one that creature blocks. In this case, creatures that can block multiple creatures must block as many attacking Breaker of Armies as possible. If you cast the exiled card, you do so as part of the resolution of Bring to Light. You can't wait to cast it later in the turn. Timing restrictions based on the card's type are ignored, but other restrictions (such as "Cast [this card] only during combat") are not. If you cast a card "without paying its mana cost," you can't pay any alternative costs, such as awaken costs. You can, however, pay additional costs, such as kicker costs. If the card has any mandatory additional costs, you must pay those to cast the card. If the card has X in its mana cost, you must choose 0 as the value of X. If you cast an instant or sorcery card this way, it goes to your graveyard as normal. It doesn't return to exile. If you don't cast the card, it remains exiled. If a spell is returned to its owner's hand, it's removed from the stack. The spell isn't countered, but it won't resolve. If a copy of a spell is returned to a hand this way, the copy will cease to exist the next time state-based actions are performed. 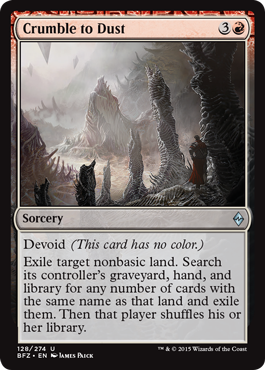 The second mode will exile the target creature or planeswalker if it would be put into the graveyard this turn for any reason, not just due to lethal damage. 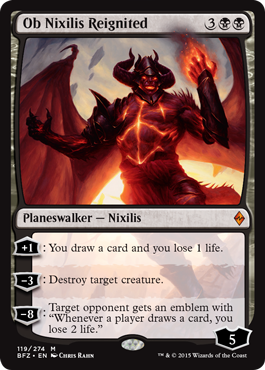 The exile effect applies to that permanent even if Brutal Expulsion deals no damage to it (due to a prevention effect) or Brutal Expulsion deals damage to a different creature or planeswalker (due to a redirection effect). 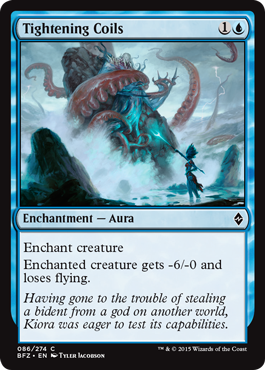 When you cast Conduit of Ruin, you may search your library for a colorless creature card with converted mana cost 7 or greater, reveal it, then shuffle your library and put that card on top of it. Conduit of Ruin's last ability doesn't change the mana cost or converted mana cost of any spell. It changes only the total cost you actually pay. Conduit of Ruin's last ability will look at the entire turn, even if Conduit of Ruin wasn't on the battlefield for some of it. Notably, if you cast Conduit of Ruin in a turn, then no other creature spell you cast that turn can be your first. Conduit of Ruin's last ability can't reduce the amount of colored mana you pay for a spell. It reduces only the generic component of that mana cost. If you control more than one Conduit of Ruin, the last ability of each of them applies only to the first creature spell you cast each turn, not to different spells; the first creature spell you cast each turn will cost 4 less. The first creature spell you cast each turn doesn't necessarily have to be the first spell you cast. You could cast a sorcery spell and then cast a creature spell that would get the discount. If there are additional costs to cast a spell, or if the cost to cast a spell is increased by an effect, apply those increases before applying cost reductions. The cost reduction can apply to alternative costs (such as dash costs). If the first creature spell you cast in a turn has X in its mana cost, you choose the value of X before calculating the spell's total cost. For example, if the first creature spell you cast in a turn has a mana cost of XG, you could choose 2 as the value of X and pay G to cast the spell. 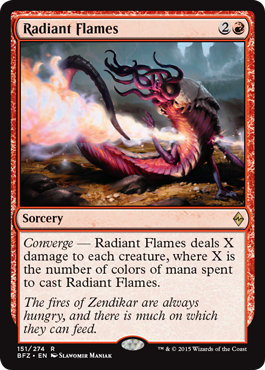 If the first creature spell you cast in a turn has converge, you can't ignore the cost reduction of Conduit of Ruin's last ability in order to spend more colors of mana. 4U: Target creature can't be blocked this turn. Once an attacking creature has been legally blocked, making it so it can't be blocked won't change or undo that block. You may leave any cards with that name in the player's graveyard, hand, or library. You don't have to exile them. Dominator Drone's last ability checks to see if you control another colorless creature at the moment it enters the battlefield. If you don't, the ability won't trigger at all. If you do, the ability will check again as it tries to resolve. If you no longer control another colorless creature, the ability will be removed from the stack and have no effect. Drana's last ability triggers after combat damage has been dealt, so only attacking creatures that survive the combat damage step in which Drana deals combat damage will have +1/+1 counters put on them. The +1/+1 counter won't change how much damage Drana or any other attacking creature with first strike or double strike deals during that combat damage step. However, the +1/+1 counters that are put on attacking creatures without first strike will affect the damage those creatures deal during the regular combat damage step. When Drowner of Hope enters the battlefield, put two 1/1 colorless Eldrazi Scion creature tokens onto the battlefield. They have "Sacrifice this creature: Add 1 to your mana pool." You can sacrifice any Eldrazi Scion to activate Drowner of Hope's last ability, not just one created by Drowner of Hope. You can't sacrifice the same permanent to pay two different costs. Notably, if you sacrifice an Eldrazi Scion to activate the last ability of Drowner of Hope, you won't add 1 to your mana pool. Dust Stalker's last ability checks to see if you control another colorless creature as the end step begins. If you do, the ability won't trigger. If you don't, the ability will check again as it tries to resolve. If you somehow control another colorless creature at that time, the ability won't do anything. You won't return Dust Stalker to its owner's hand. Dust Stalker's last ability doesn't depend on Dust Stalker being colorless. If it gains one or more colors, the ability will still look for another creature you control that's colorless. Like most abilities, Dust Stalker's last ability functions only while Dust Stalker is on the battlefield. Any permanent can have a +1/+1 counter put on it. Those counters won't have any effect unless that permanent is or becomes a creature. If you cast Earthen Arms for its awaken cost, a land you control can be both targets. 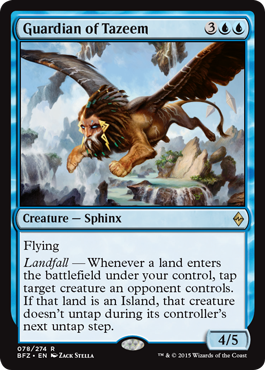 4/4 Flying Landfall — Whenever a land enters the battlefield under your control, you may return target nonland permanent card from your graveyard to your hand. If that land is a Plains, you may return that nonland permanent card to the battlefield instead. A "nonland permanent card" is an artifact, creature, enchantment, or planeswalker card. If you return an Aura to the battlefield this way, you choose what it will enchant as it enters the battlefield. This doesn't target any player or permanent, so you could attach an Aura to a permanent with hexproof controlled by an opponent, for example. If there's nothing the Aura can legally enchant, it stays in the graveyard. Encircling Fissure prevents all combat damage that would be dealt by any creature controlled by the target opponent, even if that creature wasn't on the battlefield or wasn't a creature as Encircling Fissure resolved. Check the creature's power as Exert Influence resolves to see if it's less than or equal to the number of colors spent to cast Exert Influence. If it's greater, Exert Influence will finish resolving with no effect. Once you've gained control of a creature with Exert Influence, it doesn't matter what happens to its power. Raising it won't cause the control-changing effect to end. Felidar Sovereign's triggered ability checks to see if you have 40 or more life as your upkeep begins. If you don't, the ability won't trigger at all. If you do, the ability will check again as it tries to resolve. If you don't have 40 or more life at that time, the ability won't do anything. In a Two-Headed Giant game, your life total is the same as your team's life total. As such, the ability triggers if your team has 40 or more life. You don't have to reveal a basic land card from among the five cards you look at, even if one is there. If you don't, you won't put a card on top of your library. Multiple instances of menace are redundant. 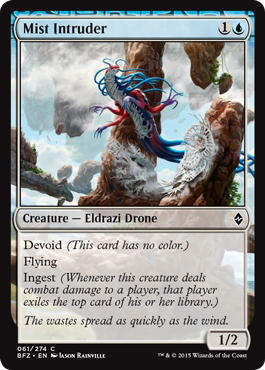 At the beginning of your upkeep, put a 1/1 colorless Eldrazi Scion creature token onto the battlefield. It has "Sacrifice this creature: Add 1 to your mana pool." 1G, Sacrifice From Beyond: Search your library for an Eldrazi card, reveal it, put it into your hand, then shuffle your library. An Eldrazi card is one with the creature type Eldrazi. Just having "Eldrazi" in its name or being an Eldrazi-themed card doesn't count. 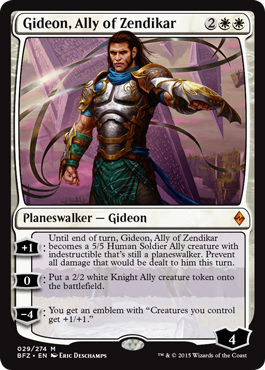 If Gideon becomes a creature the same turn he enters the battlefield, you can't attack with him or use any of his tap abilities (if he gains any). Target opponent exiles a card from his or her graveyard. You put a 1/1 colorless Eldrazi Scion creature token onto the battlefield. It has "Sacrifice this creature: Add 1 to your mana pool." The target opponent chooses which card to exile as Grave Birthing resolves. You can cast Grave Birthing targeting an opponent with an empty graveyard. Even though that player won't exile a card from his or her graveyard, you'll still get an Eldrazi Scion and draw a card. You decide whether to exile Greenwarden of Murasa as the last ability resolves. 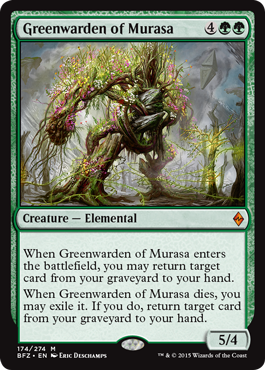 Players can respond to this ability triggering, but once it starts resolving and you decide to exile Greenwarden of Murasa, it's too late for anyone to respond. If the target card becomes illegal before the last ability resolves, it will be countered. You can't exile Greenwarden of Murasa in that case, even if you want to. Exile target creature and target land. You must target a creature and a land in order to cast Grip of Desolation. 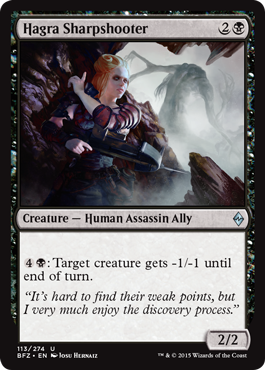 A permanent that's both a land and a creature can be chosen for both targets. 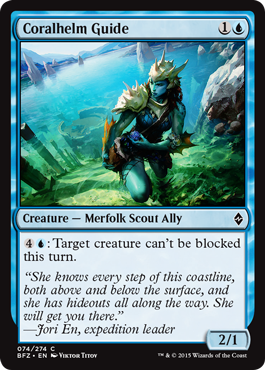 Guardian of Tazeem's landfall ability can target a creature that's already tapped. If the land that caused it to trigger was an Island, that creature won't untap during its controller's next untap step. The ability tracks the creature, but not its controller. If the creature changes controllers before its first controller's next untap step has come around, then it won't untap during its new controller's next untap step. 4B: Target creature gets -1/-1 until end of turn. An effect that gives a creature -1/-1 is different from putting a -1/-1 counter on that creature. Notably, if the target of Hagra Sharpshooter's ability has any +1/+1 counters on it, those counters will remain. Colorless spells you cast cost 1 less to cast. Herald of Kozilek's last ability doesn't change the mana cost or converted mana cost of any spell. It changes only the total cost you actually pay. Herald of Kozilek's last ability can't reduce the amount of colored mana you pay for a spell. It reduces only the generic component of that mana cost. The cost reduction can apply to alternative costs. If a colorless spell you cast has X in its mana cost, you choose the value of X before calculating the spell's total cost. For example, if that spell's mana cost is X, you could choose 5 as the value of X and pay 4 to cast the spell. The converted mana cost of a spell doesn't change if its controller paid an alternative cost (such as an evoke cost) to cast it. −8: You get an emblem with "Whenever a creature enters the battlefield under your control, you may have it fight target creature." Then put three 8/8 blue Octopus creature tokens onto the battlefield. You can activate Kiora's first ability with no targets just to put a loyalty counter on her. With Kiora's second ability, you could put no cards, a creature card, a land card, or a creature card and a land card into your hand. You will have the emblem by the time the Octopus creature tokens enter the battlefield—they'll be looking to fight! 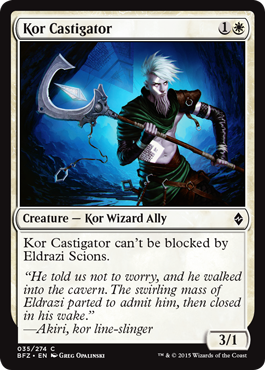 A creature that's an Eldrazi but not a Scion (or vice versa) can block Kor Castigator. Multiple instances of lifelink are redundant. There usually isn't much benefit in having the rally ability resolve more than once in a turn, other than that new creatures will be affected by the ability resolving an additional time. Lithomancer's Focus will prevent damage to the creature from any colorless source that turn, even if that source didn't exist or wasn't colorless as Lithomancer's Focus resolved. A land that becomes a creature may be affected by "summoning sickness." You can't attack with it or use any of its tap abilities (including its mana abilities) unless it began your most recent turn on the battlefield under your control. Note that summoning sickness cares about when that permanent came under your control, not when it became a creature nor when it entered the battlefield. This land is colorless until the last ability gives it colors. When a land becomes a creature, that doesn't count as having a creature enter the battlefield. The permanent was already on the battlefield; it only changed its types. Abilities that trigger whenever a creature enters the battlefield won't trigger. 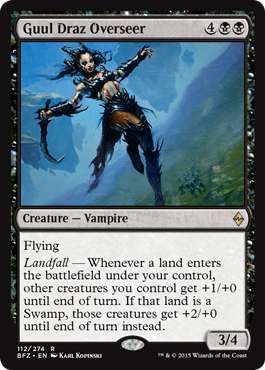 An ability that turns a land into a creature also sets that creature's power and toughness. 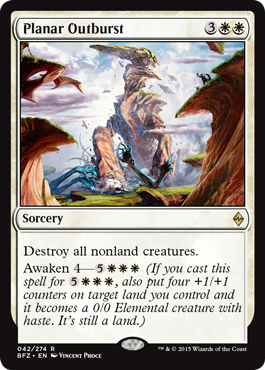 If the land was already a creature (for example, if it was the target of a spell with awaken), this will overwrite the previous effect that set its power and toughness. Effects that modify its power or toughness will continue to apply no matter when they started to take effect. The same is true for counters that change its power or toughness (such as +1/+1 counters) and effects that switch its power and toughness. 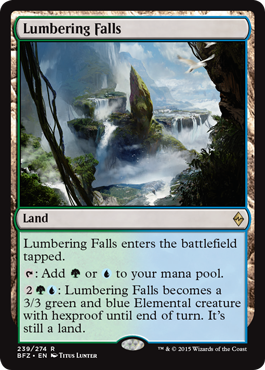 For example, if Lumbering Falls has been made a 0/0 creature with three +1/+1 counters on it, activating its last ability will turn it into a 6/6 creature that's still a land. Vigilance matters only as attackers are declared. Giving a creature vigilance after that point won't untap it, even if it's attacking. 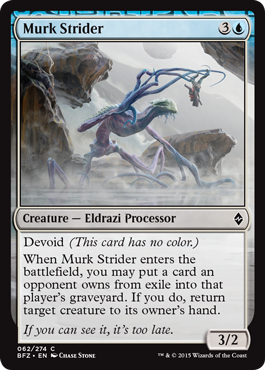 When Murk Strider enters the battlefield, you may put a card an opponent owns from exile into that player's graveyard. If you do, return target creature to its owner's hand. If the target creature becomes illegal before the triggered ability resolves, it will be countered and none of its effects will happen. You won't "process" a card in exile. Players can respond to the triggered ability, but once it starts resolving and you decide whether to put a card from exile into the player's graveyard, it's too late for anyone to respond. Although Noyan Dar's ability is very similar to awaken, it is not the same ability. 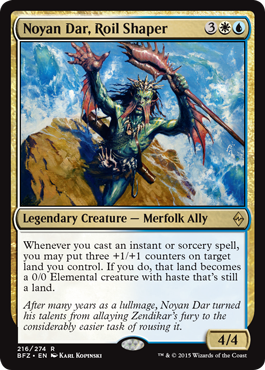 Any card that refers to a "card with awaken" doesn't include Noyan Dar. The ability will resolve before the instant or sorcery spell that caused it to trigger. The emblem created by Ob Nixilis Reignited's last ability is both owned and controlled by the target opponent. In a multiplayer game, if you own Ob Nixilis Reignited and use him to give one of your opponents an emblem, the emblem remains even if you leave the game. Oblivion Sower's ability allows you to put any land cards the player owns from exile onto the battlefield, regardless of how those cards were exiled. Cards that are face down in exile have no characteristics. Such cards can't be put onto the battlefield with Oblivion Sower's ability. 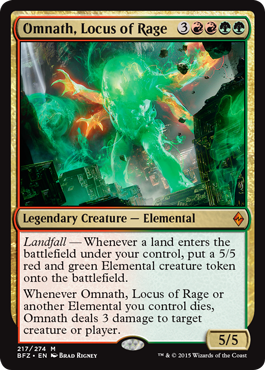 Landfall — Whenever a land enters the battlefield under your control, put a 5/5 red and green Elemental creature token onto the battlefield. If Omnath dies at the same time as any other Elementals you control, Omnath's last ability will trigger for each of them (and once for itself). Ondu Rising creates a delayed triggered ability. 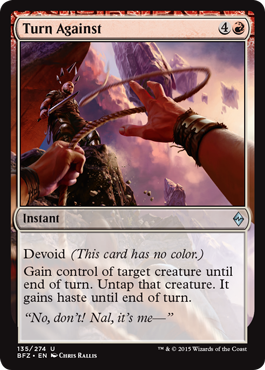 Any creature that attacks that turn will cause that ability to trigger, including creatures controlled by a teammate and creatures you didn't control or that didn't exist as Ondu Rising resolved. Notably, this includes the land creature created if Ondu Rising is cast for its awaken cost. 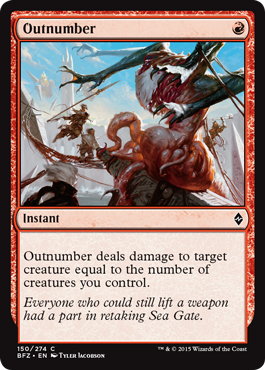 Outnumber deals damage to target creature equal to the number of creatures you control. Count the number of creatures you control as Outnumber resolves to determine how much damage Outnumber deals. Exiling Part the Waterveil is part of its effect. 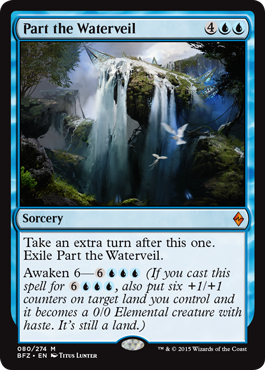 If Part the Waterveil is countered, including if it was cast for its awaken cost and the land you control became an illegal target, it will be put into its owner's graveyard. A "nonland creature" is a creature that isn't also a land. 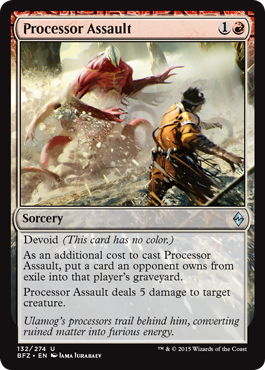 As an additional cost to cast Processor Assault, put a card an opponent owns from exile into that player's graveyard. Processor Assault deals 5 damage to target creature. You must put exactly one card an opponent owns from exile into that player's graveyard to cast Processor Assault. You can't cast it without doing so, and you can't put multiple exiled cards into their owners' graveyards this way. Players can respond to Processor Assault only after it's been cast and all of its costs have been paid. No one can try to remove the card from exile to stop you from casting the spell. Quarantine Field enters the battlefield with X isolation counters on it. When Quarantine Field enters the battlefield, for each isolation counter on it, exile up to one target nonland permanent an opponent controls until Quarantine Field leaves the battlefield. Use the number of isolation counters on Quarantine Field as its triggered ability is put on the stack to determine how many targets you may choose. Once the targets are chosen, the number of targets the ability has is locked in. 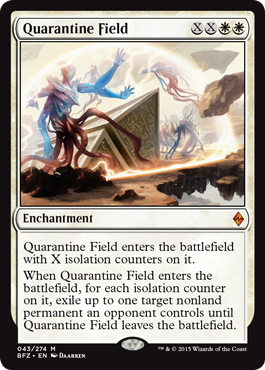 Changing the number of isolation counters on Quarantine Field won't change how many nonland permanents are exiled. If Quarantine Field exiles multiple permanents, those cards all return to the battlefield at the same time. If Quarantine Field leaves the battlefield before its triggered ability resolves, no permanents will be exiled. Auras attached to the exiled permanents will be put into their owners' graveyards. Equipment attached to the exiled creatures will become unattached and remain on the battlefield. Any counters on the exiled permanents will cease to exist. If a token is exiled, it ceases to exist. It won't be returned to the battlefield. The exiled cards return to the battlefield immediately after Quarantine Field leaves the battlefield. Nothing happens between the two events, including state-based actions. In a multiplayer game, if Quarantine Field's owner leaves the game, the exiled cards will return to the battlefield. Because the one-shot effect that returns the cards isn't an ability that goes on the stack, it won't cease to exist along with the leaving player's spells and abilities on the stack. Reckless Cohort can attack if you control another Ally. It just isn't forced to. Reckless Cohort checks whether you control another Ally as attacking creatures are declared. At that time, if you don't, Reckless Cohort attacks if able. If, during its controller's declare attackers step, that player doesn't control another Ally but Reckless Cohort is tapped, is affected by a spell or ability that says it can't attack, or hasn't been under that player's control continuously since the turn began (and doesn't have haste), then it doesn't attack. If there's a cost associated with having Reckless Cohort attack, its controller isn't forced to pay that cost. If he or she doesn't, Reckless Cohort doesn't have to attack. If you cast Rising Miasma for its awaken cost, creatures will get -2/-2 before the land you targeted is turned into a creature. Unless it was already a land creature before Rising Miasma started resolving, it won't get -2/-2. 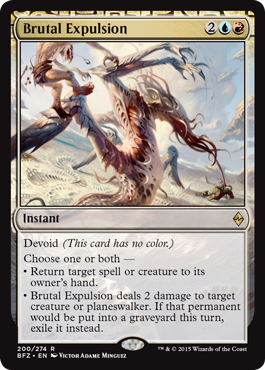 Roil's Retribution deals 5 damage divided as you choose among any number of target attacking or blocking creatures. You choose how many targets Roil's Retribution has and how the damage is divided as you cast the spell. Each target must receive at least 1 damage. If some, but not all, of the targets become illegal by the time Roil's Retribution tries to resolve, the original division of damage still applies, but no damage is dealt to illegal targets. If all the targets are illegal, the spell will be countered. 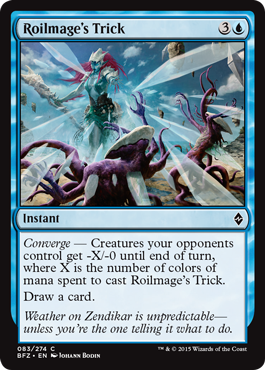 Converge — Creatures your opponents control get -X/-0 until end of turn, where X is the number of colors of mana spent to cast Roilmage's Trick. You can cast Roilmage's Trick even if your opponents control no creatures. You'll simply draw a card. You choose how many targets Rolling Thunder has and how the damage is divided as you cast the spell. Each target must receive at least 1 damage. If some, but not all, of the targets become illegal by the time Rolling Thunder tries to resolve, the original division of damage still applies, but no damage is dealt to illegal targets. If all the targets are illegal, the spell will be countered. Rush of Ice can target a creature that's already tapped. It still won't untap during its controller's next untap step. Rush of Ice tracks the creature, but not its controller. If the creature changes controllers before its first controller's next untap step has come around, then it won't untap during its new controller's next untap step. Each target must be a different creature. You can't cast Serpentine Spike without three different creatures available. If one or two of those targets become illegal by the time Serpentine Spike resolves, you can't change how much damage will be dealt to the remaining legal targets. A creature doesn't necessarily have to be dealt lethal damage by Serpentine Spike to be exiled. After being dealt damage, if it would die for any reason that turn, it'll be exiled instead. Multiple instances of lifelink are redundant. Activating the last ability more than once won't cause you to gain additional life if Shambling Vent deals damage. 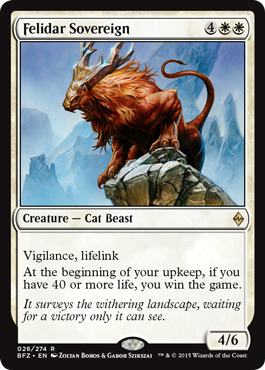 An ability that turns a land into a creature also sets that creature's power and toughness. 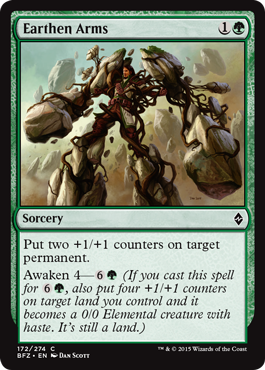 If the land was already a creature (for example, if it was the target of a spell with awaken), this will overwrite the previous effect that set its power and toughness. Effects that modify its power or toughness will continue to apply no matter when they started to take effect. The same is true for counters that change its power or toughness (such as +1/+1 counters) and effects that switch its power and toughness. For example, if Shambling Vent has been made a 0/0 creature with three +1/+1 counters on it, activating its last ability will turn it into a 5/6 creature that's still a land. Whenever a land enters the battlefield under an opponent's control, that player exiles the top two cards of his or her library and you draw two cards. The cards are exiled from the library face up. If that player has one card in his or her library when Sire of Stagnation's triggered ability resolves, that card will be exiled. If his or her library has zero cards, no cards are exiled. In both cases, you'll still draw two cards. That player won't lose the game (until he or she attempts to draw a card from an empty library). 1B: Regenerate Skitterskin. Activate this ability only if you control another colorless creature. Once you legally activate the ability, it doesn't matter what happens to the other colorless creature. The ability will resolve and create a regeneration shield even if you don't control another colorless creature at that time. Skitterskin's activated ability doesn't depend on Skitterskin being colorless. If it gains one or more colors, you can still activate the ability if you control another creature that's colorless. 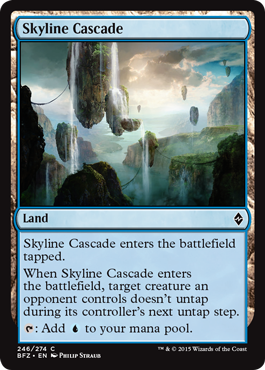 When Skyline Cascade enters the battlefield, target creature an opponent controls doesn't untap during its controller's next untap step. Skyline Cascade's triggered ability doesn't tap the creature. It can target any creature, tapped or untapped. If that creature is already untapped at the beginning of its controller's next untap step, the effect won't do anything. The triggered ability tracks the creature, but not its controller. If the creature changes controllers before its first controller's next untap step has come around, then it won't untap during its new controller's next untap step. You can choose any value for X. 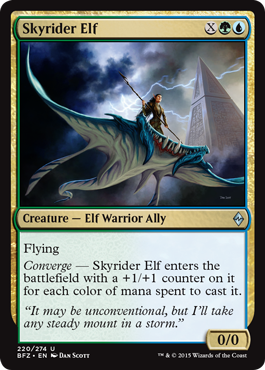 The value chosen for X doesn't directly affect the number of +1/+1 counters Skyrider Elf enters the battlefield with, but it does let you pay more mana and thus spend more colors of mana to cast it. For example, you can choose 0 for the value of X and pay GU to cast Skyrider Elf for two +1/+1 counters. You can also choose 3 for the value of X, making its mana cost 3GU, and pay WUBRG for five +1/+1 counters. You choose which creature you control to sacrifice as the first triggered ability resolves. Players can respond to this ability triggering, but once you choose a creature to sacrifice, it's too late for anyone to respond. If Smothering Abomination is the only creature you control as its first triggered ability resolves, you must sacrifice it. Sacrificing Smothering Abomination will cause its last ability to trigger. 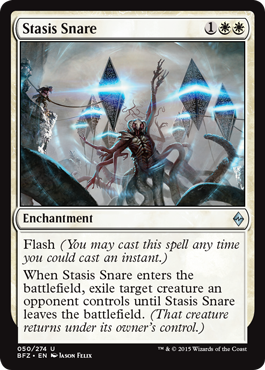 If Stasis Snare leaves the battlefield before its triggered ability resolves, the target creature won't be exiled. Auras attached to the exiled creature will be put into their owners' graveyards. Equipment attached to the exiled creature will become unattached and remain on the battlefield. Any counters on the exiled creature will cease to exist. 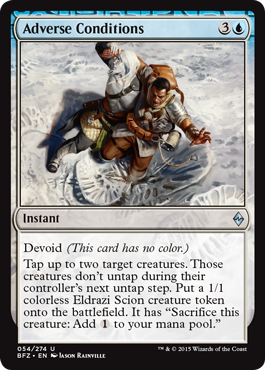 The exiled card returns to the battlefield immediately after Stasis Snare leaves the battlefield. Nothing happens between the two events, including state-based actions. In a multiplayer game, if Stasis Snare's owner leaves the game, the exiled card will return to the battlefield. Because the one-shot effect that returns the card isn't an ability that goes on the stack, it won't cease to exist along with the leaving player's spells and abilities on the stack. 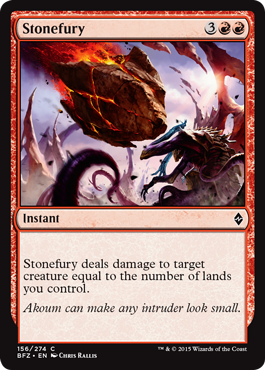 Stonefury deals damage to target creature equal to the number of lands you control. Count the number of lands you control as Stonefury resolves to determine how much damage is dealt. Creatures you control get +2/+0 until end of turn. Colorless creatures you control also gain first strike until end of turn. 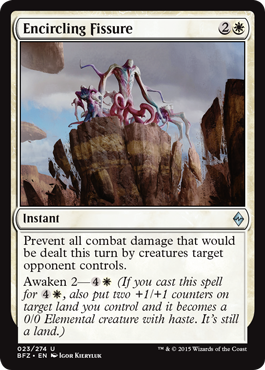 A colorless creature given first strike by Swarm Surge won't lose first strike if it stops being colorless later in the turn. Putting a land onto the battlefield this way is not the same as playing a land. Swell of Growth doesn't affect how many lands you can play from your hand during your turn. You can cast Tandem Tactics with no targets. When it resolves, you'll gain 2 life. However, if you cast Tandem Tactics with any targets and all of those targets are illegal as it tries to resolve, it will be countered and none of its effects will happen. You won't gain 2 life in that case. Enchant creature Enchanted creature gets -6/-0 and loses flying. If an effect gives the enchanted creature flying after Tightening Coils became attached to it, the creature will have flying. 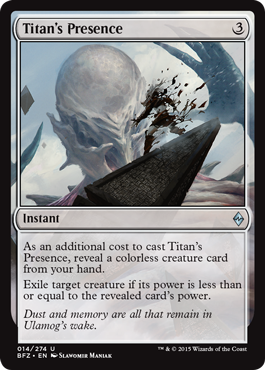 As an additional cost to cast Titan's Presence, reveal a colorless creature card from your hand. The colorless creature card stays revealed until Titan's Presence leaves the stack. The colorless creature card you reveal doesn't have to still be in your hand as Titan's Presence resolves. If it's not, use its power as it last existed in your hand. Check the target creature's power as Titan's Presence resolves to see if it's less than or equal to revealed creature card's power. If it's greater, Titan's Presence will finish resolving with no effect. 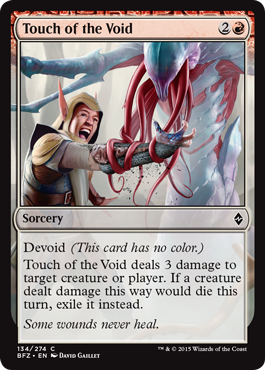 Touch of the Void deals 3 damage to target creature or player. If a creature dealt damage this way would die this turn, exile it instead. A creature doesn't necessarily have to be dealt lethal damage by Touch of the Void to be exiled. After being dealt damage, if it would die for any reason that turn, it'll be exiled instead. Turn Against can target any creature, even one that's untapped or one you already control. Use the highest converted mana cost among permanents you control as Ugin's Insight resolves to determine how many cards you scry. If X is 0, you won't scry at all. Any abilities that trigger whenever you scry won't trigger. Ulamog's first ability resolves independently of Ulamog once they've both been put on the stack. If Ulamog is countered, that triggered ability will still resolve. That triggered ability will always resolve before Ulamog does. Cards exiled by Ulamog's first and third abilities are exiled face up. If the player has fewer than 20 cards in his or her library, exile all of them. That player won't lose the game until he or she has to draw a card from an empty library. If Undergrowth Champion is dealt damage from multiple sources at the same time (for example, if it's blocked by multiple creatures), its prevention effect will apply once to all that damage. You'll remove only one +1/+1 counter. 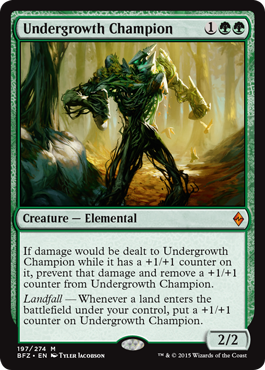 If damage that can't be prevented is dealt to Undergrowth Champion while it has a +1/+1 counter on it, you'll still remove a +1/+1 counter on it. 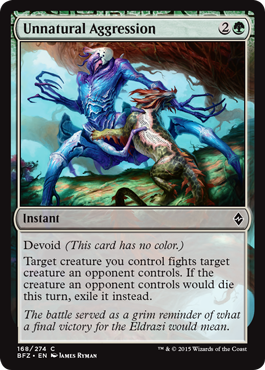 If the creature an opponent controls survives the fight but would die later in the turn for another reason, it will be exiled instead, whether your creature dealt it damage or not. If the creature you control becomes an illegal target (perhaps due to being destroyed by another spell or ability), Unnatural Aggression will resolve, but the target creature an opponent controls will neither deal nor receive any damage. If that creature would die later in the turn for another reason, it will be exiled instead. 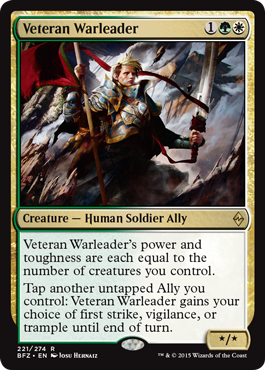 The ability that defines Veteran Warleader's power and toughness works in all zones, not just the battlefield. If Veteran Warleader is on the battlefield, it will count itself. You choose which ability Veteran Warleader gains as the last ability resolves, not as you activate it. Vile Aggregate's power is equal to the number of colorless creatures you control. The ability that defines Vile Aggregate's power works in all zones, not just the battlefield. If Vile Aggregate is on the battlefield, it will count itself. 1G, Put a card an opponent owns from exile into that player's graveyard: Put a 1/1 colorless Eldrazi Scion creature token onto the battlefield. It has "Sacrifice this creature: Add 1 to your mana pool." Once you announce that you're activating this ability, players can't respond until after you have paid its costs and completed activating it. Specifically, no one can try to remove the card from exile to stop you from activating the ability. Effects that increase or reduce the cost to cast a spell don't affect that spell's converted mana cost. For spells with X in their mana costs, use the value chosen for X to determine if the spell's converted mana cost is even or not. For example, your opponent could cast Endless One (with mana cost X) with X equal to 5, but not with X equal to 6. For creatures on the battlefield with X in their mana costs, the value for X is 0. Mistcutter Hydra (a creature with mana cost XG) could block, but Endless One could not. The converted mana cost of a face-down creature is 0. Void Winnower will stop face-down creatures from blocking. The ability triggers whenever you cast an instant or sorcery spell that targets only Zada and no other object or player. If you cast an instant or sorcery spell that has multiple targets, but it's targeting only Zada with all of them, Zada's ability will trigger. 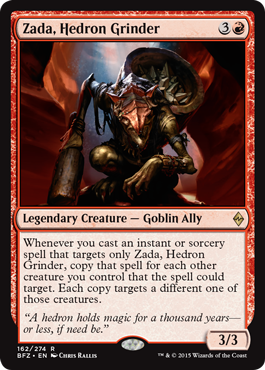 Any creature you control that couldn't be targeted by the original spell (due to shroud, protection abilities, targeting restrictions, or any other reason) is just ignored by Zada's ability. You control all the copies. You choose the order the copies are put onto the stack. The original spell will be on the stack beneath those copies and will resolve last. The copies that the ability creates are created on the stack, so they're not cast. Abilities that trigger when a player casts a spell (like Zada's ability itself) won't trigger. If the spell that's copied is modal (that is, it says "Choose one —" or the like), the copies will have the same mode. You can't choose a different one. If the spell that's copied has an X whose value was determined as it was cast (like Rolling Thunder does), the copies have the same value of X. Magic: The Gathering, Magic, Battle for Zendikar, Magic Origins, Khans of Tarkir, Fate Reforged, Dragons of Tarkir, and Zendikar are trademarks of Wizards of the Coast LLC in the USA and other countries. ©2015 Wizards.